Meera in anger shouts that Gopi was not her mother because she had married to someone stranger. She blames her that she had forgotten her papa even she was conscious at that time. Vidya comes. Dharma asks her to give sympathy to her and leaves. Molu goes to Urmila’s house with Monika. Urmila is in very joyful mood. She becomes excited. She asks Sona to greet her Devrani. Monika troubles her as Urmila tightly hugs her. The term uric paste which she was applying to Jai and Veeru, she applies on her. Monika in anger shouts and orders to clean it. Then Jai and Veeru come towards her to apply paste. She falls. Sona in anger scolds them. Molu asks if Kokila had come here. 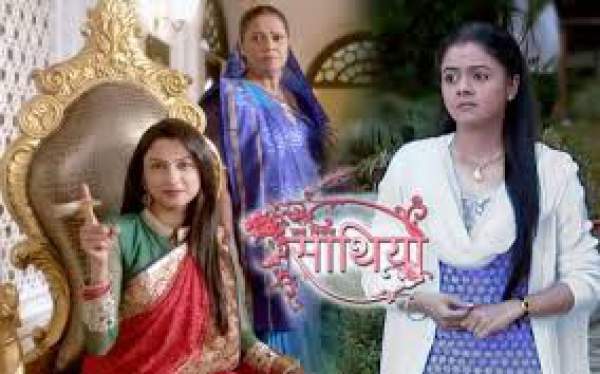 By listening to it, Urmila and Sona are shocked and asks where did Kokila go. Monika pulls Molu along with her and leaves. Dr. Krishna informs that Kokila was in the hospital. Urmila tells it to Sona and both leave for the hospital. Gopi reaches the hospital. She asks Dr. Krishna what had happened to her. Dr.Krishna relaxes her and says Kokila was not in deep injury and would get conscious. Then Urmila and Sona comes. Gopi feels very happy to see them. She hugs Urmila in happiness. She gives Prague by tips to Sona. Sona says that she had twins at home. To hear this Gopi felt happy. Then Dr. Krishna informed them that Kokila was awake then. They all goes into Kokila’s room. Meera sees all the family pics and gets emotional. She cries. Vidya asks if she loved her mother. Meera replies in positive and says that she had spent her childhood without her mom, and she had spent time with her papa. She also says that when her mother came, her father had died, and her mother had married with someone else. She cries that her mother was not with her in any problem and never supported her emotionally. Gopi says that Kokila told her that she had gone to Modi Bhawan, and nobody had looked at her. Kokila blames herself. And says it was her mistake. Urmila asks Kokila why she was hiding the truth from Gopi. Kokila asks her what has happened to her.